When I turned on the fan for the air conditioner in our Fleetwood camper all it would do was hum. If left on, the circuit breaker would trip out. I turned it off and took off the cover so I could get at the fan blades. I checked to see that there wasn't something jammed in the vanes and spun it. It spun freely. Then I turned it on back on while it was still turning. It came full on then. This is a pretty clear indicator of a bad start capacitor. 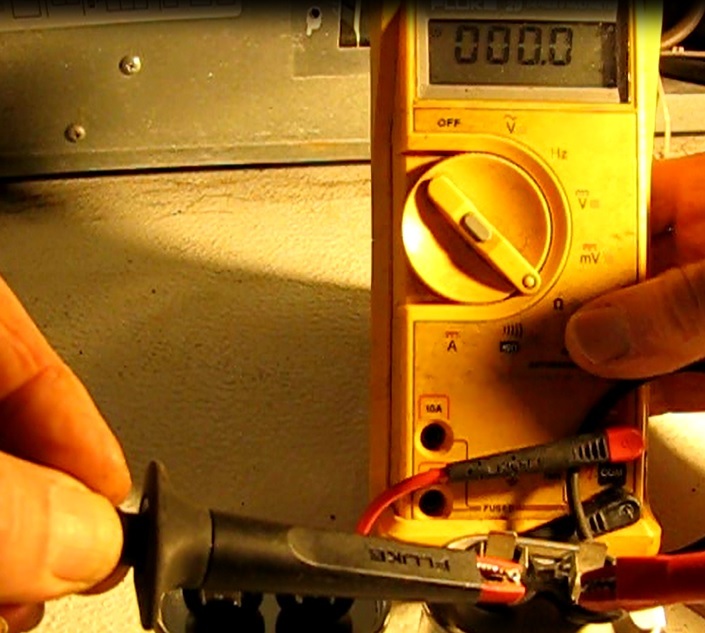 The capacitor is an electrical component with two leads and with a shape of a small can. Often it will be mounted under a cylindrical cover on the motor itself and other times located remotely with wires running to the motor. The only job of a start capacitor is to provide a phase shift between the current and voltage needed to start the rotational motion of the motor. 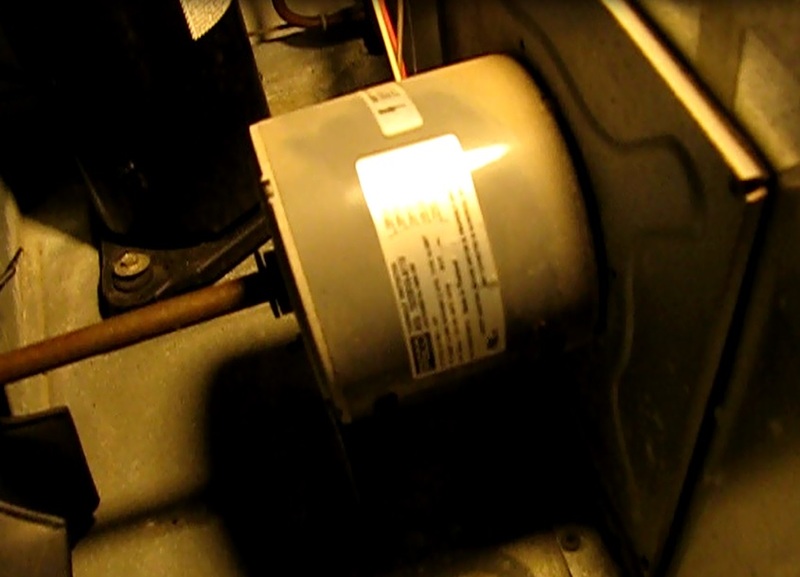 This post will cover details on finding, removing and replacing the fan capacitor on an RV ac unit model 8333D876 made by Recreational Vehicle Products of Wichita, KS as found on a 2006 Fleetwood Sea Pine folding camper. 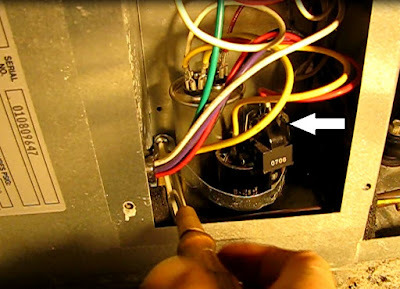 1) Disconnect the unit from power. Unplug, disconnect or turn off the breaker. 2) Get to the motor in question. On this RV, I first had to remove the molded plastic two piece cover protecting the AC unit from the elements. It was held on by four Phillips screws on top. Then two snap-on connections must be pried apart on both sides. Then the cover can be hinged upward and pulled off the AC unit. 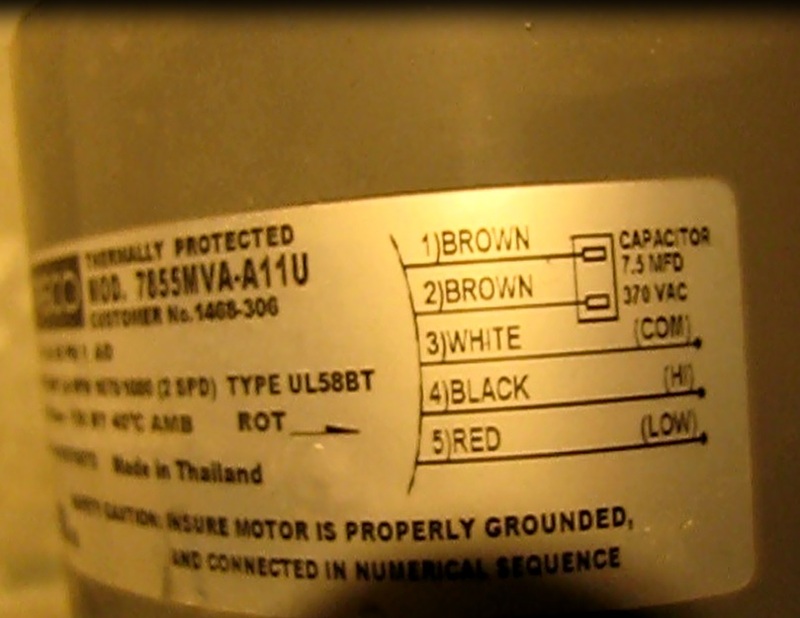 The motor name plate sticker listed the value of the capacitor and the color of the wires connected to it. They were both brown. 3) Find the capacitor. If the capacitor is mounted on the motor, it will be under a can shaped cover mounted to the motor body. This is most common. On this unit, though, it was mounted remotely behind an access cover on the left side of the unit. Following the two brown wires from the motor led to the 7.5 MFD 370V capacitor. 4) Remove the capacitor. This one was physically secured, along with two other capacitors for the compressor, with a band strap. Loosening a Phillips screw a few turns allowed the capacitor to pulled out, still wired up. 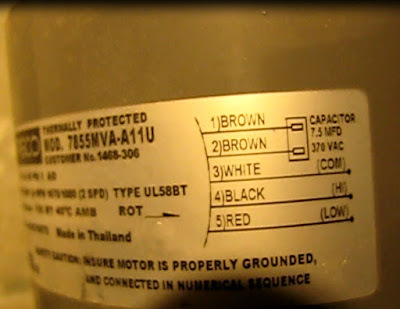 In this case the wires were the same brown color, although the AC unit schematic diagram showed a brown and brown and white. I labelled the wires, as is good practice, so that the replacement would be wired the same way. Pull the wires off. This one used two spade-style connectors. My meter has a capacitance function and testing revealed no reading whatsoever. This capacitor was bad. 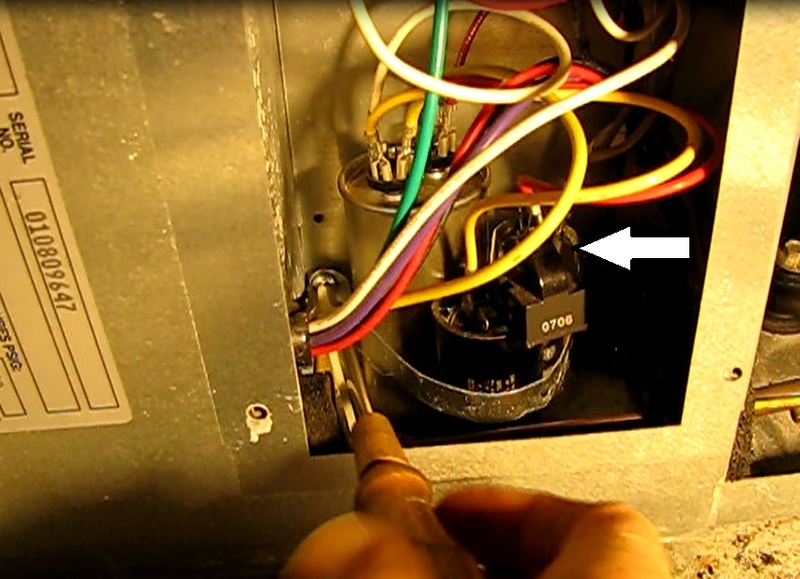 This test isn't absolutely necessary but can prevent the replacement of a good part and send you off in search of the real problem, perhaps wiring or an internal motor issue. There's no capacitance to be found here! 1) Locate the correct replacement part. I found a replacement part on Amazon. As long as I had my meter handy, testing revealed a value of 7.5 MFD. 2) Install the capacitor. This is a matter of simply plugging it in as per the original.